If you want to feel like home, surely one of the rooms of Montsonis Medieval get comfortable and feel so comfortable as if you were there. Suite rooms equipped with sheets, towels and central heating. Surprise your partner with a romantic getaway weekend with dinner and a room full of romance and emotions. 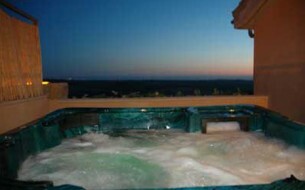 Enjoy the Jacuzzi bubbles in a pool outdoors under the stars in an atmosphere of tranquility and relaxation. Looking for a spain villa to escape with your partner? Here you will find the best selection of apartments and houses special escape for couples.